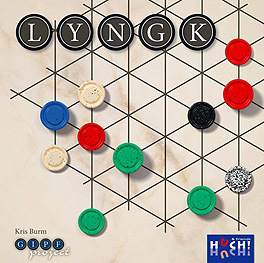 LYNGK is the synthesis of the 6 games of the GIPF project. It is played with pieces of 5 different colours. During the game, the players must claim 2 colours each: the pieces in these colours can be used as a network of multiple moves. The aim is to build stacks that consist of 5 differently coloured pieces.